This month the review page is dedicated to games begining with the letter "L". There is also the added theme that all the games reviewed are Point and Click adventures. The quality of the three games is extremely high and it proved very difficult to choose a game of the month. The deciding factor was mainly the length of game time rather than the quality of the interface / problems / graphics or music. The first game to be reviewed is Lethal Formula which involves a scientist called Professor Endsworth who is working for the mega-corp CENTECH when he discovers Substance H a drug which could revolutionise medical science. However CENTECH are revealed to be an Evil Global Corporation and are planning to use the formula to make a new addictive version of the drug with Endsworth knowledge. He soon finds out and decides to break into the headquarters of CENTECH to steal his formula. The formula is located on a ship which is about to be launched to a secret destination and so begins the game "Lethal Formula". The game was written by Edmund Clay using the Graphic Adventure Creator or GRAC as it was known. More information about GRAC and Edmund can be found by visiting the website for DTO Software. The game is professionally presented, the background graphics are well drawn and the animation of the main character is good. The only criticism is that the game is very short and can be completed within 20 mins. The puzzle involving the fire extinguisher is not one you would have thought of in advance and therefore will likely result in you dying at the first attempt. There is a solution available which will be included in our cheats / walkthrough section in the next few days. Overall this is a fun game which provides a good introduction to point and click adventuring. It is a shame that the world and puzzles were not expanded as the game contains all the ingredients and production values to have been a classic of the genre. The game can be downloaded from our new download page for game titles starting with L.
In Legend of the Elves you play the part of Eric, a young Elf who lives with his family in a small house on Corvée Island. One day after returning from his regular fishing trip, Eric discovers something which makes him embark on an extremely serious and desperate adventure. You control Eric as he searches for clues and help to aid him on his journey. 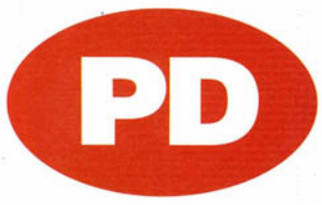 The game was created by Peter Armann and he still maintains a website dedicated to the game. Visit armann.co.uk to obtain more information about the author - history of the game and instructions on how to install the game to a hard drive. The game was released at the end of the Amiga's life in 1999. 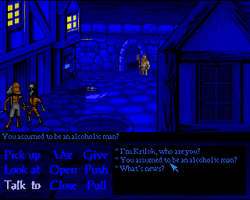 It received favourable reviews in the Amiga press and was awarded the Amiga Format Reader Game of the Month Award in June 1999 where it was described as "A pretty accomplished adventure game with its tongue firmly lodged in its cheek"
Similar to Lethal Formula the game has high presentation standards in both animation - graphics and user interface. Unlike Lethal Formula the game is larger and will provide a longer challenge for the gamer. The game took four years to make and there was a planned part 2 to the adventure. Unfortunately this seems to have never been started or completed and therefore this game is the only one available in the series which is a shame. Similar to Lethal Formula this game will provide a nice introduction to the point and click genre. The puzzles are not too difficult and there is a handy hints section on Armann's website, including the complete solution for those stuck. As is the normal case with Point and Click adventure's the best advise always seems to try numerous actions on the different items shown on the screen such as lifting or looking inside items. If you enjoyed Lethal Formula then this should provide a more challenging but not impossible to complete adventure. The game can be downloaded from our new download page for game titles starting with L or directly from Armann's website. Similar to Legend of the Elves this series of Point and Click games is unfortunately not complete. Available to download and play are Chapters 2 and Chapter 3 - the first chapter was never made or released which is a pity as the author has stated that the first chapter would have explained the whole plot to the game. Nevertheless there are two great adventures here for you to complete. Whilst both Legend of the Elves and Lethal Formula provide a good short introduction to the point and click games the Lord of Alcandria games are epic and will take over an hour to complete both games. As mentioned already the game starts with Chapter 2 as the first installment was never released which means you are going to be thrown into the deep end in terms of plot but don't let that put you off as this game oozes professionalism and charm. The opening scene in Lord of Alcandria Chapter 2 starts in a grave yard of Alcandria from which your hero Krilok Rainwood - The great fighter - emerges from the grave. I guess that the first chapter would have ended with the death of this character but beyond that until we hear from the author it is going to remain a mystery. The initial impression is that the game pays homeage to the popular Monkey Island series with its use of blue backgrounds and cartoon style. The animation is smooth and the quality of the graphics is of a commercial standard and definately justified being published as licenceware upon its first release. There are clever uses of sound effects and music to add to the atmosphere and soon you will find yourself emerged in the game. The plot for the second chapter starts with your character being resurrected by the group called the Giant Defenders to defeat Kellock. The humour is created right from the start with the Giant Defenders realising they have resurrected the wrong body. Despite this Krilok is keen to help and the first task is set involving finding the mage Elder to obtain a protection spell. Heading into the town of Alcandria reinforces the sense of Monkey Island with the layout of the town and location of the characters following the layout of the first Monkey Island game. This is a game which should be played at a leisurely pace with a large cup of tea. The graphics, music, animation and sound effects all work in harmoney to great a sensory experience. This game is the closest to perfection I have seen from a licenceware / shareware game and I can't recommend it more highly. The first installment will probably take you an hour to complete but it won't be chore and should make you eager to download and play Chapter III. Spoiler alert, if you are going to play the games then don't watch the videos the whole way through as they contain the solution and are a walkthrough from start to finish. After completing Chapter II your character sets of for Lotharia armed with spell from the mage Elder. The user interface remains the same for Chapter III but the quality of the graphics have improved from the earlier tale which rises the standard of this series even further. The quality of the music and sound effects remain the same high standard. It is hard to believe that this was the work of just one individual when most games of a similar quality would have involved a large team of programmers, artists and musicians. The two Lord of Alcandria games are worthy editions to any amiga disk catalogue and it is a shame that the first chapter was never made to complete the series and fill in the gaps.